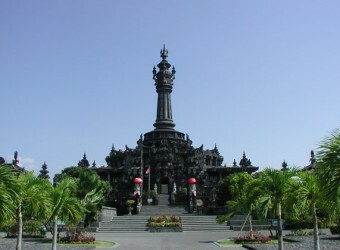 Bajra Sandhi is in Renon district in east Denpasar. It is the governmental business area where Bali Governmental office and Japanese Consulate, etc. gathering. Bajra Sandhi stands out with the beautiful silhouette tower in these buildings, and it is the new sport built 5 years ago; the outside is monument, and inside is the historical museum. It was difficult for me to remember the name…(LOL) I heard its name from the guide for many times. The monument is also beautiful viewed from distance. It is surrounded by park. The students were doing sport also many people.